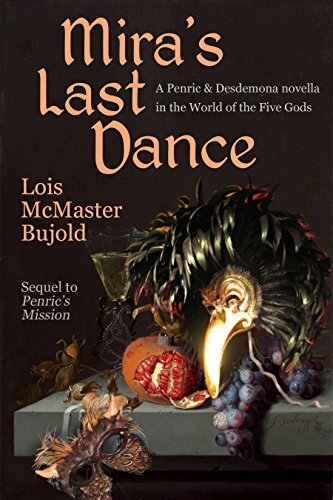 Mira’s Last Dance: Penric & Desdemona Book 5 is the shortest Penric novellas so far, and yet it is in many ways the most enjoyable. It is a brief sojourn into the wit that Bujold displays in her Vorkosigan books, that sly gleam of humor as she leads us on a dance (pun intended) through innocence and innuendo, through discretion and distraction, and through male and female minds and female minds within male minds. It’s a witty romp through dangerous territory as Mira, one of Desdemona’s progenitors, plays with us and her victims as she veils and unveils, well, just about everything. On one hand, this is an incredibly fun and witty comedy, on the other, a breathless tale of near misses and escapes. If you love Penric, Bujold, or fantastical fantasies, this is simply a must-read addition to the Penric-Desdemona canon/cannon.